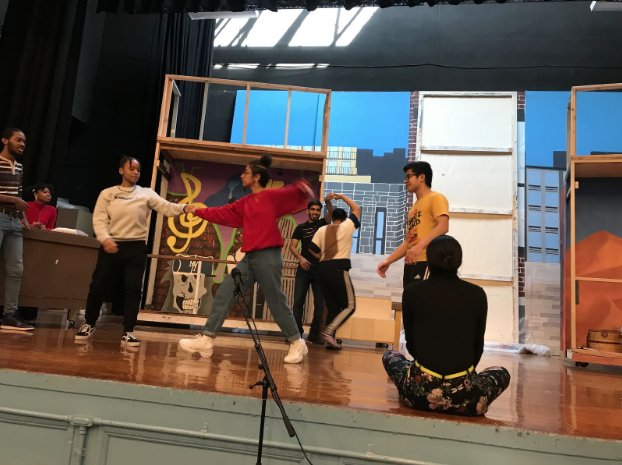 The theater production class will be performing its rendition of In the Heights on Thursday, May 2, at 4:00pm and Friday, May 3, at 6:00pm. Tickets will be sold for $5.00 in the school store starting mid-April and at the door on performance day. In the Heights is a hit Broadway musical from 2008, written by Lin-Manuel Miranda, who also wrote Hamilton. In the Heights was Miranda’s first play. It won Tony awards for best musical, best original score, and best choreography, and a Grammy award for best musical theater album. It also got the Laurence Olivier award for outstanding achievement in music. The story takes place on the Upper West Side of Manhattan from roughly 165th street to 178th street. Every character is from a different island in Central America; you’ll learn a little bit about each of their lives. Getting ready for a play is especially stressful as the performance days come closer and closer and time for practicing is running out. This means more chaos but also more excitement. “I get more excited to show everyone what we’ve been working on for months now and to show how much we love this show along with the people in it,” said Gomez. When going on stage, the actors feel a ton of different emotions. You never know what can happen when you are on stage. The class has been working on the production since the beginning of the spring semester. Stage managers Sarah Beckman ’19 and Zhanna Olevskaya ’19 explained that they have to set everything up as far as props and where and when the dances are going to be. It’s a challenge to bring it all together.